The cows are eating their last pastures of the 2014 grazing season. I have a few more paddocks with some stockpiled grass for them to enjoy, until the winter snows blow. They are in the most east pasture now, munching on third cutting hay, left to grow to nourish the plant roots. The frost has signaled the grass to go dormant, so lightly grazing the hayfield won’t hurt a thing. 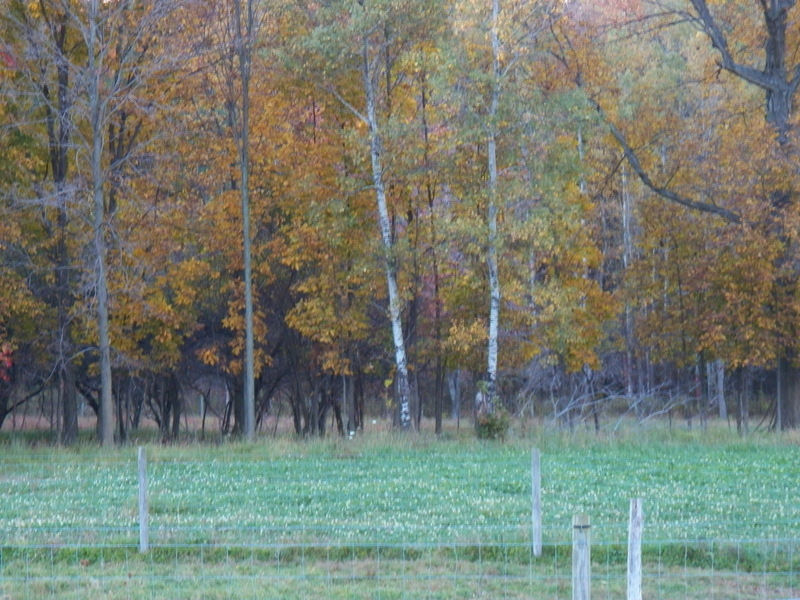 The wooded pasture in the photo is the next hamlet for the cows. The woods provide some shelter from the late autumn winds. The grass lush and green will provide some very good meals for my soon to be momma cows. One young lady had her calf last week. She is still camera-shy, but we will see about that! My horse pasture grows short. The horses are just tonight starting to be supplemented with hay, a little each day at meal time. They eat their oats and clean up the hay by morning. I am sure winter will soon be here. Our logging job, cleaning up the old fallen oak begins Wednesday. The horses and equipment are ready to go. I just need to roll up some broken fence and the job can start. The horses will be given an old hay field with some corn fodder on one end as a jump lot this winter. They will paw down through the snow and eat the stockpiled grass and the leaves from the corn fodder. The frozen ground will keep them from damaging the soil and plants beneath their big feet. The area is more for excercise than for feeding. The grass is just a bonus. The cow’s last pasture for the season has waist-high grass and red clover standing in it. A large grove of white pines will provide shelter and protection from the elements for the cows and their calves. Once the pasture has been eaten down, they will spend the winter under the barn overhang. This last pasture will provide a playground on nice days, once the cattle are moved to the barnyard for winter. This is one of the farming practices I’d like you to speak about to the Leadership class. Low input…self sufficiency. Can’t wait! Looking forward to “telling my story” myself.